The CEO of Vigilent (formerly called Federspiel Controls) Mark Housley, says there’s been so little technology introduced into cooling systems for data centers “it’s almost criminal,” and adds “I’d be generous to say cooling systems have 1960’s level of technology.” Cooling systems for data centers — huge chillers that make sure servers in data centers don’t overheat — are often times responsible for half of a data center’s energy consumption, and Vigilent provides smart software via a wireless sensor network to manage and optimize these cooling systems. The seven-year-old company might have a new name (unveiled this week for the Uptime Institute Symposium), but it isn’t a stranger to the market. Its technology is managing over 2 million square feet of data centers, it has 45 data center installations (150 actual networks installed) and customers include content deliver network Akamai (s AKAM), Japanese telco NTT (s NTT) (and two other of the world’s largest telcos) and the state of California. Housley says the company is profitable, and has only raised a “small amount” of private investor money and very recently added on a small venture round from an undisclosed investor. A typical Vigilent system costs around $200,000 and provides a two to three year return on investment, says Housley. 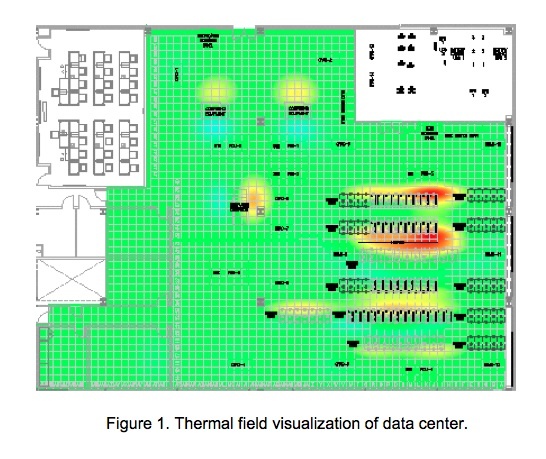 For that cost, Vigilent data center customers get a wireless sensor network (manufactured by Dust Networks) installed, and get the data center hooked up with Vigilent’s software that gives operators a real time look into the temperature of the areas throughout the data center (see image). Vigilent’s system can often times enable companies to remove entire chillers (commonly 30 to 40 percent of the air conditioning) out of the equation, reducing significant amounts of power. For example, for one of Vigilent’s customers with a 10,000 square foot data center in San Francisco, Calif., Vigilent was able to advise the customer to remove 9 of their 14 chillers, and the system ended up reducing fan energy by 65 percent. Housley explained to me that sometimes chillers are actually blowing air too hard and heating up the data center. On top of the energy savings Vigilent, says having a better overview of the cooling systems and temperature of a data center can lead to improved reliability (servers aren’t overheating and failing), and can also reduce maintenance costs — removing chillers from the data center, removes the cost of maintaining those extra chillers. Vigilent also says compared to other competitor’s systems, it can be installed in a manner of days because it’s wireless. Competitors that are also offering various data center energy management systems include SynapSense, and Power Assure. Data center energy consumption has finally become an important issue for Internet companies and data center operators. Yahoo (s YHOO), Facebook and Google (s GOOG) are all investing significantly in developing lower power data centers in an effort to reduce riding energy costs. Data centers are estimated to consume around 2 percent of the energy in the U.S. and that number is expected to grow as more and more people connect online and by always-on gadgets, cell phones and laptops.